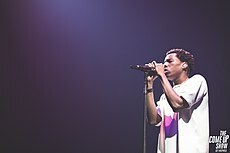 Denzel Spencer (born April 18, 1996), better known by his stage name Roy Woods (stylized as Roy Wood$), is a Canadian singer, rapper and songwriter. He is best known for his song "Jealousy". Woods is signed to OVO Sound, of which was the record label that was co-founded by Canadian rapper and singer Drake, record producer Noah "40" Shebib and Oliver El-Khatib. Woods is also the founder of the collective, called Unlock The Underground. For over three years, Woods attended Richmond Hill High School and eventually made a decision to move to St. Augustine Secondary School during his final year. Before his music career took off, he was often recognized for his commitment and talent in the sport of football. The origin of his name 'Roy' comes from a youth that lived in the same building as him from Brampton. Woods took a survey throughout his high school and Roy Wood$ seemed to be the winning ticket. On July 11, 2015, Drake premiered the first song, called "Drama" from Woods' EP, titled Exis. The song was also premiered on Apple's Beats 1 radio during the first OVO Sound radio show. The track also features with the guest appearances from Woods' label boss, Drake. On July 25, 2015, a second song, titled "Get You Good" premiered on the second episode of the OVO Sound radio show. On July 31, 2015, Roy released his debut EP Exis digitally through OVO Sound, of which was the record label co-founded by Canadian rapper and singer Drake. On October 9, 2015, Woods released his first music video for his song, "Jealousy". It has since garnered over 9,000,000 views on YouTube. In 2016, Woods announced via Twitter that his new project, titled Waking at Dawn will be dropping soon. Waking at Dawn was released on July 1, 2016, promoted by Woods and other artists, including Drake and Wiz Khalifa through social media. On December 22, 2016, Woods released his second EP, titled Nocturnal. On July 20, 2017, Woods released the track, called "What Are You On?" as the lead single from his debut album, Say Less. On November 17, 2017, Woods released the title track, called "Say Less" along with the album pre-order. On December 1, 2017, Woods released his debut studio album, Say Less. On June 8, 2018, Woods released two new singles, titled "Snow White" and "Russian Cream" with no prior announcement. On February 8, 2019, Roy Woods released a single titled "Worth It". Woods has said some of his biggest influences are Michael Jackson, Drake, Nelly, The Weeknd and PartyNextDoor. Woods has also started an artist collective, titled Unlock The Underground, which is a branch of the OVO Sound. The artists on this collective include Toronto talents TRIPSIXX, DRIPXXXX and DOLOINDACUT as Roy's Official DJ. Woods has also had other underground artists open for him at his shows, such as other members of the OVO Sound group, 24hrs, and members of his collective. Label: OVO Sound, Warner Bros.
^ "Roy Woods - Biography, Credits and Discography". AllMusic. Retrieved July 22, 2015. ^ "Is Roy Wood$ the Rap Version of Michael Jackson? | NOISEY". Retrieved 2015-07-26. ^ "Running Through The Six: A Look at Toronto's Emerging Artists". HYPETRAK. Retrieved 2015-07-26. ^ "Drake Debuts 3 New Remixes on First Beats 1 Show: Listen Now". Billboard. Prometheus Global Media. Retrieved July 13, 2015. ^ "Roy Wood$ on Twitter". Twitter. Retrieved 2016-05-03. ^ a b "Roy Woods – Chart History: Canadian Albums". Billboard. Retrieved December 12, 2017. ^ a b "Roy Woods – Chart History: Billboard 200". Billboard. Retrieved December 12, 2017. ^ a b c "Roy Woods – Chart History: R&B/Hip-Hop Albums". Billboard. Retrieved December 12, 2017. ^ a b c "Roy Woods – Chart History: R&B Albums". Billboard. Retrieved December 12, 2017. ^ "Instagram post by ROY WOOD$ • Aug 1, 2017 at 9:01pm UTC". Instagram. Retrieved August 2, 2017. ^ "Waking at Dawn by Roy Woods". iTunes Store. Apple. Retrieved July 1, 2016. ^ "Exis - EP by Roy Woods". iTunes Store. Apple. Retrieved July 31, 2015. ^ "Kid. Studio - Get You Good". Kid. Studio. Retrieved December 14, 2015. ^ "Drake and Future Announce Summer Sixteen Tour". The Fader. Retrieved April 25, 2016.